Sort file:- Canterbury, March, 2019. Page Updated:- Saturday, 09 March, 2019. Above photo, 1886, kindly sent by Rory Kehoe. Above showing the "Three Compasses" date unknown. Above photo, circa 1921. Kindly sent by Rory Kehoe. Above photograph taken by Edward Wilmot in 1965. Above showing the sign of the "Three Compasses" date unknown. 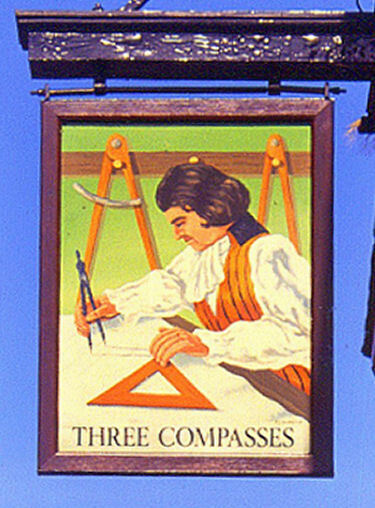 Three Compasses sign right May 1991. Also known as the "Carpenter's Arms" this pub was listed in the 1692 licensing list and the following year under that name offering billeting for 6 soldiers. By 1769 and perhaps as early as 1700 it was called the "Three Compasses." It remained under this name till early in 2001 when it changed name to the "Westbar," then again around 2007 to "City One," and lastly in June 2009 to the "Lady Luck." 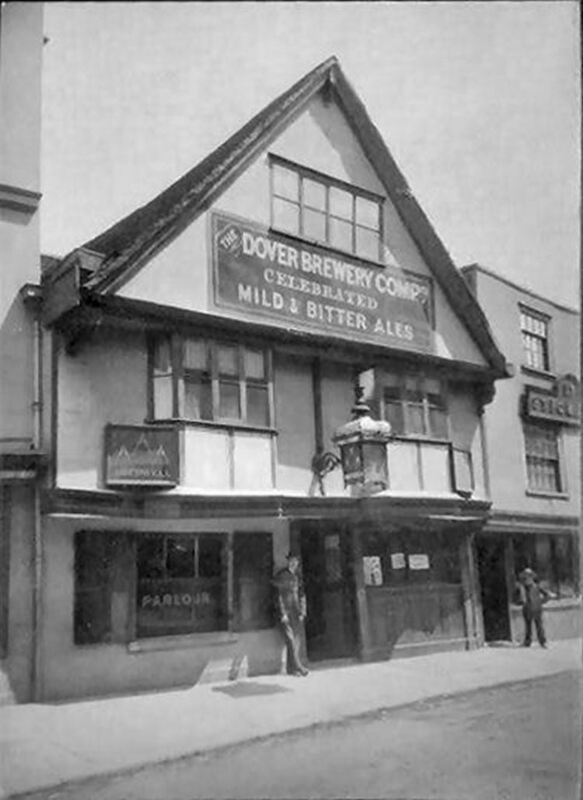 The Inns of Canterbury by Edward Wilmot's,1988, mentions a document, date circa 1945 that gives the description of clientele at the pub as being "Businessmen, shoppers, visitors." From the Kentish Gazette, Friday 2 February, 1808. 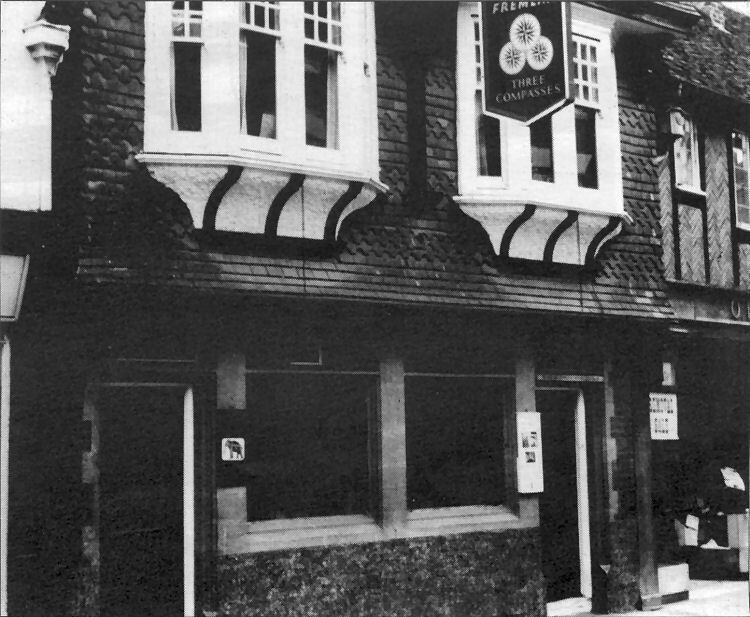 Between the hours of eleven and two in the night of Sunday last, the "Three Compasses" Public House, in Northgate Street, Canterbury, was broke into by forcing a window-shutter, and lifting up the sash. The thieves proceeded to the bar, from whence they carried off the till, containing about four pounds in halfpenee; and, after ransacking a desk, retreated without obtaining any further booty. Kentish Gazette 09 June 1809. June 5, Mr. Edward Wilson, master of the "Three Compasses" public-house, in St. Peter's Street. Canterbury. From the Kentish Chronicle, 21 January, 1860. A railway labourer, from Chartham, was brought up in custody, charged with being disorderly at the "Compasses" public-house, St. Peter’s, a little before eleven o'clock on Sunday night. He had been given into custody by John Harris and John Edward Harris, who charged him with assaulting them. When the complainants were called in Court they did not appear. The Mayor said, as the complainants did not appear, the defendant would be discharged. From the Kentish Chronicle, 11 February, 1860. 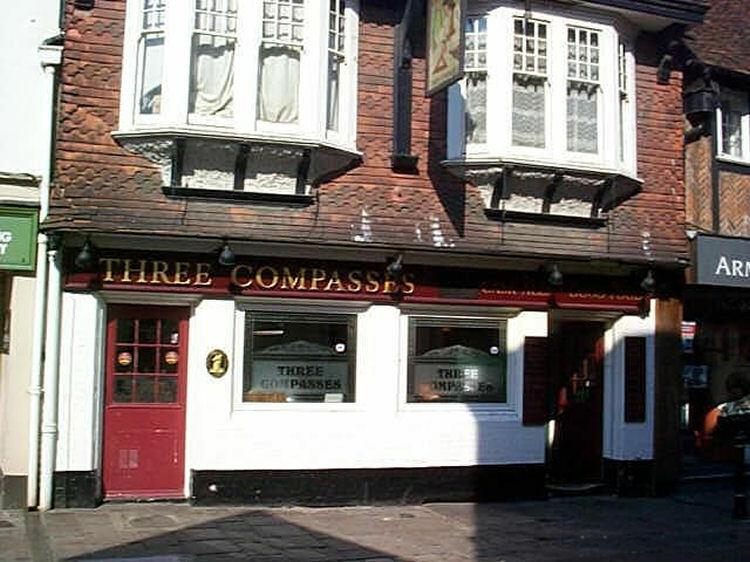 £10 has been paid to the funds of the instituteion by Mr. James Holden, of Whitstable, executor, the amount bequesther by the late Miss Hopper, of Whitstable; likewise the sum of £2 10s., the amount collected at Mr. Stephen Back's the "Three Compasses Inn," Canterbury. From the Kentish Chronicle, 5 May, 1860. A railway labourer, whose name did not transpire was charged by the landlord of the "Three Compasses" public house, St. Peter’s, with creating a disturbance in his house, and doing certain damage to his doors, &c., on Saturday evening. The case being fully proved, the Bench fined the defendant in the amount of the damage and costs, or in default of payment seven day’s imprisonment. From the Kentish Chronicle, 6 October, 1860. CANTERBURY POLICE COURT. MONDAY. VIOLENT ASSAULT. John Green (a young wan who has been several times before the Magistrates in connection with street broils) was charged with a gross assault upon a labourer named Wise. The complainant was coming out of the "Three Compasses," in St. Peter’s-street, when defendant struck him violently in the face, and then ran off. Complainant followed, and when in Lamb lane, the defendant again struck and kicked him in the face, which bore evidence of the violent nature of the assault. Fines 40s., and 6s. costs, or to be imprisoned for one month. From the Kentish Chronicle, 17 November, 1860. On the Public Service. Seringapatam, July 26th, 1799. Sir,—I request that you will be so kind as to send me, in the course of the morning, an account of the quantity of salt that you have forwarded to the Commissary of the provisions department, for the use of the army and of the detachment with the order of Lieut. Col. Shaw, also an account of the number of draught and carriage bullocks that you have furnished to him and the commissary of stores, and to the corps belonging to that detachment, for the carriage of their camp equipage and stores. Among the miscellaneous articles we noticed the Collar of the blouse in which Courtenay was shot; the cap that George III wore at his christening; a volume containing 16 various almanacks published in the 1746, with the design G.R. and the royal arms, displayed in the tooling of the binding, it is evident from the library of George II which is now preserved in the British Museum; a sword and shield and shield belonging to a chief taken during the Sikli war; a curious instrument with several blades dug up in the Old Park; a tooth from the head of Sir Thomas More, which is buried in St. Dunstan's church; a piece of silver lace from a coat once worn by Louis Phillipe; numerous arms, fish, shells, and fossils, and a magnificent tusk of the mammoth, &c.
From the Kentish Chronicle, 29 December, 1860. Before T. Philpott, E. Wootton, and William Plummer, Esqrs. Robert Carter, labourer, was charged with being drunk find disorderly in the "Three Compasses" public-house, on Saturday night, and damaging a table and other articles. Mr. Back, the landlord, deposed that the defendant was drunk in his house, about nine o’clock, when he appeared to be very disorderly. He succeeded in inducing the defendant to leave the house, but he returned again in about a quarter of an hour, and commenced fighting with one of his companions. During the disturbance some glasses and a table were broken, the damage being estimated at 5s. With the consent of the Bench, the case was settled out of court, the defendant paying the damage and 2s. 6d. expenses. From the Kentish Chronicle, 20 April, 1861. Isabella Robinson was brought up on remand charged with uttering a forged cheque. Mr. Brydges attended and, on being sworn, deposed that he never either signed, or authorised any one to sign the cheque produced. The case was further remanded in order to enable the prisoner to produce evidence of having received the check from a man named Philips. Mr. Back, landlord of the “Three Compasses” public house, charged Edward Purver, labourer, with assaulting him on Saturday night. The complainant deposed that the defendant was drinking in his house on Saturday night when a glass was broken. He asked the defendant to pay for the glass, but the latter refused, and asked for a parcel he had previously given into the landlord’s core. The complainant refused to give up the parcel until the glass was said for. The defendant then took hold of the complainant by the neckerchief and threw him down. The defendant, who said he could not remember anything of the circumstances, was fined 10s. and 6s. expenses, or in default of payment to be imprisoned fourteen days. From the Kentish Chronicle, 21 March, 1863. DRINKING THE PRINCE OF WALES’S HEALTH. 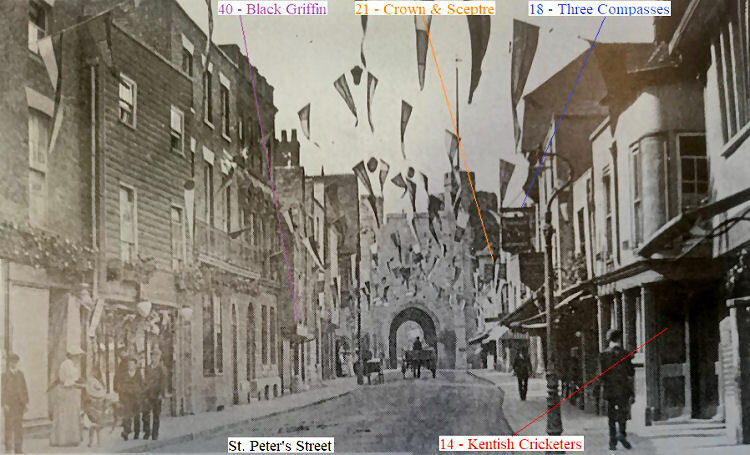 During the past week a votary of Bacchus, who gave the name of John Kelly, was had before the Canterbury justices, charged with stealing a bottle of brandy, from the “Three Compasses” in St Peter’s-street, on the day of the Prince's wedding. It was an impudent robbery, and clearly proved. The prisoner boldly walked into Mr. Back's house, helped himself to a bottle of brandy from the shelf, which he deliberately placed under his coat, and walked off. He was, however, seen by the prosecutor's daughter, who followed him, and gave him into custody with the stolen brandy in his possession. In answer to the charge, he said he had been to several public-houses, to see if he could get some beer, but as he could not get any, he thought he would drink the Prince’s jolly good health in a glass of good brandy. The bench rewarded him with an order for six weeks in the city gaol. From the Kentish Chronicle, 6 February, 1864. WILFUL DAMAGE IN A PUBLIC HOUSE. Charles Beck, a private in the 19th Hussars, was charged with committing a very gross outrage at the “Three Compasses” public house, St. Peters-street, Mr. S. Back, landlord of the “Three Composes” deposed that the prisoner was drinking at his bar about half past ten o'clock on Sunday night. He struck the pewter top of the counter very violently several times with his whip, damaging it to the amount of 10s. As he left the house Mr. Back heard a great crash, and at that moment the gas went out, in consequence of which Mr. Back could not go out for about a minute. When he got into the street there were several people assembled, but the prisoner was out of sight. The window was broken, but Mr. Back did not see the prisoner do it. The damage to the window was about £2. In reply to the bench Mr. Back said he had no witnesses who saw the prisoner break the window. The magistrates fined the prisoner 5s., 10s. for the damage done to the counter, and 5s. costs, with the alternative of 21 days’ imprisonment with hard labour. From the Whitstable Times, 19 November, 1870. Donations received:— £4 2s. 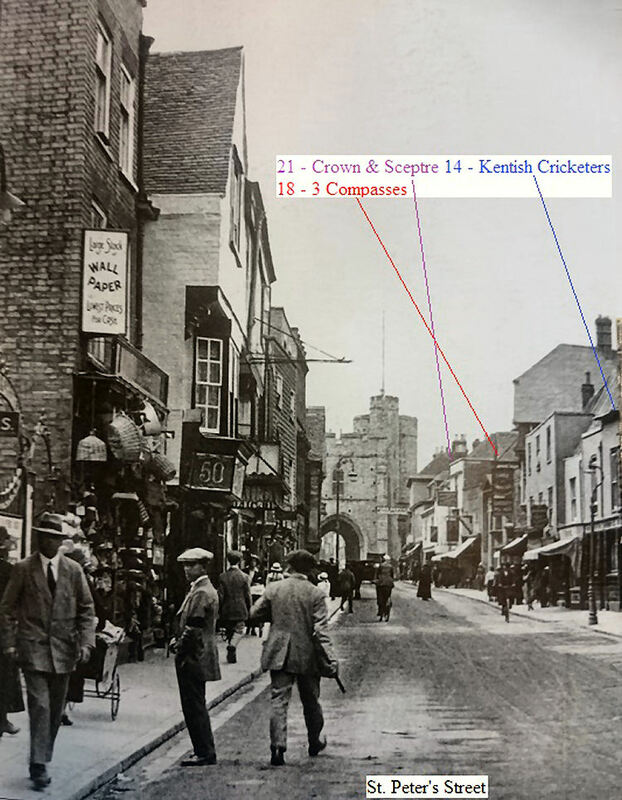 3d., amount of collection made at Mr. Rye's, “Three Compasses Inn,” St. Peter’s- street, Canterbury. From the Whitstable Times and Herne Bay Herald. 14 July 1894. Price 1d. CANTERBURY POLICE COURT. TRANSFER OF LICENSES. The following were granted new licenses:- “Three Compasses,” St. Peter's Street, to Mrs. Harrison.